I wrote a blog post not too long ago in which I was critical of those who, in an effort to make worship more enjoyable, use video and other technology to “manipulate people’s emotions.” Unfortunately, this left a few readers with the impression that I’m against the use of technology; which is certainly not the case. I think there are both positive and negative aspects to technology. 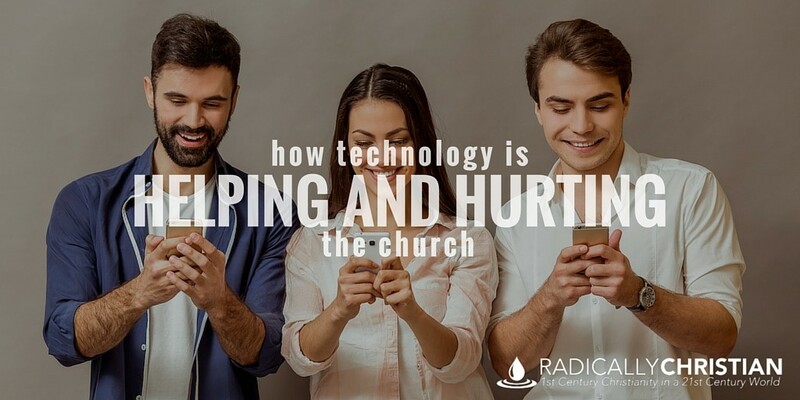 Here are a few thoughts on how I believe technology is both helping and hurting the church today. Greek and Hebrew Words -The Olive Tree Bible app with “Enhanced Strong’s Dictionary” allows me to tap on any word to see the Greek or Hebrew word and its definition. This has enhanced not only by personal Bible studies, but also the way I learn during sermons and Bible classes. Various Translations – I believe it is best to use multiple translations of the Bible when you study. Using a Bible app on a smartphone or tablet allows a person to access dozens of translations instantly. Accessibility and Mobility – One of the greatest benefits of using a Bible app is having your Bible with you wherever you go. Distractibility – It’s hard to keep reading the Bible when a text message, a tweet, or some other notification pops up. Furthermore, it’s hard not to periodically switch over to Facebook or Twitter, just to see what’s happening. It requires a tremendous amount of discipline to just read the Bible when doing so from a device. Context – When I’m looking at the open pages of my printed Bible, I can usually see two or three chapters of text (much more than I can see on a small screen). This allows me to visually recognize when a word or phrase is used several times in a particular context. Experiencing the Text – We experience words on a page differently than we experience them on a screen. “Modern screens and e-readers fail to adequately recreate certain tactile experiences of reading on paper that many people miss and, more importantly, prevent people from navigating long texts in an intuitive and satisfying way” (source). For me, the best solution is to use both a digital and a printed Bible. I switch back and forth between these two mediums and I encourage others to do likewise. I encourage those who use Bible apps not to completely abandon their printed Bibles, because there are many benefits to using a printed Bible. At the same time, I also encourage Christians who use printed Bibles not to be critical of their brethren for using mobile devices to study Scripture, because there are many benefits to that as well. One of the giant advancements in the world of technology is social media. It’s hard to believe, but Facebook boasts over 1.5 billion users! That is over 21% of the world’s population! Social media is all about bringing people together. It can bring Christians together with non-Christians and give us the opportunity to impact their lives with the gospel. It can also bring Christians together with one another and help us teach, reprove, correct, train, and encourage one another. I have found social media to be a huge blessing to my life and my work as an evangelist. But as much as social media brings people together, it also has the tendency to isolate us. We’re engaging with a device, rather than engaging with the people in the same room. We have thousands of virtual relationships, but very few genuine relationships. I believe the church needs to take advantage of the opportunities afforded us by social media, but guard against the ever-growing problem of isolation. We need to use phones and computers to the glory of God, but we also need to know when to turn them off and get out in the real world to serve people and touch their lives. In order for social media to help the church and not hurt the church, we must exercise discipline. These forms of visual media have been invaluable in our efforts to impart truth from the pulpit and in the classroom. Modern technology helps the church take these efforts to the next level. The church is creating some amazing resources. Consider my friends over at Ripple of Light Productions and another group of which I recently became aware, Appian Media (who currently has a Kickstarter project you should check out). Jeremy Dehut: Why Create This ResourceFor those considering backing this project, take note of the tier that will allow members of our team to come to your local congregation and present material from this exciting Bible lands series. bit.ly/followingthemessiahIn the meantime, Jeremy Dehut explains why he believes such a resource is so valuable and what attracted him to be a part of this exciting project. Please continue to help us spread the word so that we can make this available for free to every student of the Bible! THANK YOU to everyone that has already partnered with us! The downside is, it’s possible to become so dependent on visual media that Bible study alone seems dull. Instead of being an expedient to learning and growth, it can become an impediment. We want these tools to enhance – not eclipse – our study of Scripture. We want people to be more intrigued and fascinated by Scripture, not get the impression Scripture is boring all by itself. how much is too much and how much is just right? when is it appropriate and when is it not? when is it helping and when is it hurting? It would be foolish to “throw the baby out with the bathwater.” The parable of the talents ought to teach us that every opportunity ought to be used for our Master’s glory (Matthew 25). We cannot afford to bury the opportunities the Lord has given us. At the same time, we must be wise, discerning, and cautious. That is the life of a steward.